When we had Waverly, except for the birth and parenting classes that we took , we didn't know much else about babies. So, while we felt confident that we could change a diaper and give her the Heimlich maneuver if (God forbid) it was ever needed, we didn't know which brand of diapers that would be best or which car seat and stroller would fit our family perfectly. I spoke with other moms and did some online searches and we prepared our home for Waverly's arrival. Through trial and error (just say no to the diaper wiper warmer), we found the products that made our lives happy. For example, we tried four different strollers until were found "the one." (We donated the others.) Having Wave was everything we ever imagined it would be. Each day brought another miracle, another moment of absolute love. 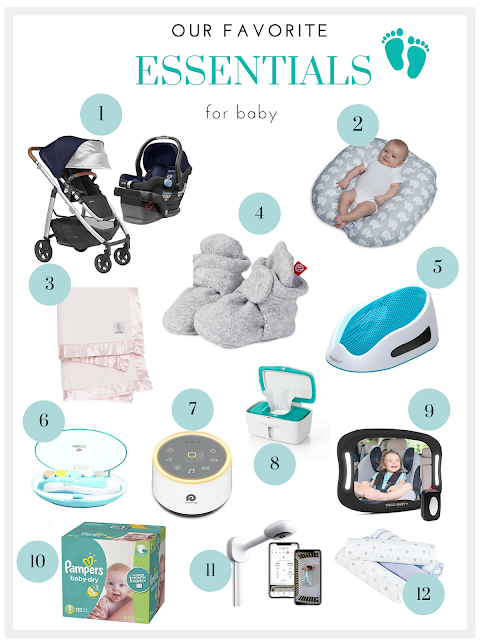 We were grateful that there were great products out there that helped to make our family more comfortable. Now that Waverly is 16 months-old, L and I feel like pros at this baby thing which is coming in especially handy now that two of my best friends are expecting their first babies. When they asked me for recommendations, I was more than happy to share with them these products that made our lives happier this past year+. If there is a baby product that you love, I'd love to hear it! The stroller seat can either face the parent or face out which I really like. We knew this was a major expense but since we use this every day, this is our favorite baby purchase. I would highly recommend this stroller. 3. The Little Giraffe blanket is the softest, most comfortable blanket you will ever feel. It is like the underbelly of a kitten. Of all of the blankets Waverly has, this one is her favorite. I love how she slowly rubs the blanket against her lips as she falls asleep. 4. Waverly is a magician when it comes to socks and shoes. Since she was old enough to grab, she has taken off her socks the moment I put them on. (The same goes with hats and bows.) So last winter when she waved her little cold feet happily in the air after removing her warm socks, I knew I had to find a solution. I ordered these Zutano booties and because of their design, Waverly could never take these off. They kept her feet warm all winter. They come in a great assortment of colors and fabrics and I love that the baby's feet were always cozy. She only stopped wearing them when she started walking and only then because they didn't have a grip bottom. 5. I love this little baby bath. Waverly has bathed in this lounger since she was born and she still sits in it as I bathe her. It's soft and pliable and fits in most sinks (and tubs.) I like that the lounger is perforated so the water can go right through (as well as any bio matter!). It's a steal at under $15. 6. I was so nervous the first time I had to trim her nails. The baby nail clipper was enormous in comparison to her tiny nails. Even with the emery board I felt like I was taking sandpaper to my baby's delicate pink fingers and toes. I did some searching and asked other experienced moms what they recommended. Several recommended this battery operated nail trimmer which has multiple speeds and comes with several attachments. I started off using the softest buffer pad on her nails and she barely reacted. I now use the second softest pad on her nails and it does a great job of eliminating sharp edges without feeling like I could hurt her skin. 7. I can't sleep without a white noise machine and so we thought Waverly might like one as well. We have tried several and right now we are using the Dreamegg which produces a white noise as well as other relaxing sounds like the ocean, which is the one we listen to. It also has a soothing nightlight. She seems to love falling asleep to this. I can't imagine not having this noise machine which does a great job of blocking the ambient house noise. 8. I know it may sound like a silly thing but I was so frustrated by our baby wipe packs and dispensers. I'd want one wipe but I'd yank out three or five or more. L found this Oxo baby wipe dispenser and I can't believe how much I love this product. Because of a weight inside, when you pull out a wipe, you only pull out one. You can continue pulling more, of course, but if you need just one, just one is what you will get. It comes in white, with a selection of accent colors. A word about the electric diaper wipe warmers. We bought one and we disliked it immediately. Even with adding water to the stack of wipes you insert into the container, the wipes were either soaking wet/dripping or dry. Waverly didn't seem to care of the wipes were warm or not and I couldn't wait to replace it with the Oxo. 9. Friends of mine told me I absolutely needed one of these mirrors so I could see the baby while driving. We bought one thinking it couldn't hurt but I didn't really appreciate it until we were driving a rental car in Boston and L and I realized we couldn't see our five week-old baby in the backseat for the 90 mile drive to visit our family. I ended up sitting in the backwith her for the entire trip. On my next (solo) trip back east with Waverly I had forgotten that I didn't have a mirror in the backseat of the rental car. When she was in her carseat, it was so quiet that I worried that her head may have tilted forward (a dangerous position which can impair breathing). I was driving on the Mass Turnpike and I called her name but didn't hear anything. I tried opening the windows to let in the winter air. I turned the radio up. I said her name repeatedly. I heard nothing and yes, I pulled over to the side of the highway so I could make sure she was OK. (She was. She just sleeps deeply, especially in the car.) I picked up this mirror the next day. I like this one because it has a light and a remote control to turn on the light. The mirror not only allows me to ensure that Waverly is OK but she can also see me which soothes her. We have this mirror in both of our cars and we bring one with us when we travel. It's an essential. 10. We started with Pampers in the hospital and we continued using them when we got home. When Waverly was a few months old we tried other brands (Honest, Huggies, Costco. . .) as well as other versions of Pampers but we always come back to Pampers Baby Dry. These are the only diapers that I love. They don't leak. They fit her well and most importantly she has never experienced diaper rash when she wore these. As soon as we tried other diapers, even Pampers Overnights, Waverly was irritated. I couldn't be happier with Pampers Baby Dry and recommend these to my friends. 11. I had one requirement for our baby monitor. I wanted to be able to see Waverly in her crib without touching a monitor. I wanted to just open my eyes and see that she was OK before I drifted off back to sleep. I leave all of the home technology to L and he selected the Nanit which I love. It's safe (no strangers tuning in), it's high tech and it gives us great information like the temperature and humidity level of her room as well as when she went to sleep and when she wakes up throughout the night. Each week we receive a report on how she slept the previous seven days. I couldn't be happier with this monitor. 12. One of favorite gifts we received was this aden + anais 100% cotton muslin 4-pack of swaddling cloths. They are the perfect size (44 x 44) to swaddle Waverly but they were also great to use as a burp cloth. I used this light blanket over her stroller hood to keep the strong Boston summer sun away from her delicate skin when we went out for walks. I also used these to drape over her in the car in case she got to cool from the A/C. I love these soft blankets which get softer as you wash them. They are still a favorite of Waverly's. They come in dozens of color packs and designs, perfect for any nursery.